Leave it to Chrissy Teigen to share yet another super relatable moment on Instagram. One of the many reasons why this outspoken A-list momma is a social media queen (hey, 20 million-plus Instagram followers and counting) is that she isn't afraid to give us a glimpse into what's really happening behind the scenes of her glamorous life. Hilarious beauty treatments included. Teigen most recently shared her mid-week spa day with the Internet. She first snapped a photo with a decadent cream lathered over her face, and then shared another image of an intense (and slightly terrifying) device being circled over her face and neck to "tighten" her skin by a professional. 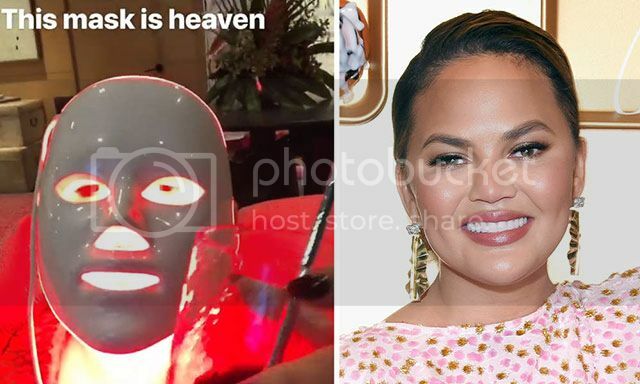 In the final snap, we saw Teigen chilling out in the luxurious Deesse Pro LED mask from celebrity facialist Shani Darden, which we're seriously coveting. We'll admit: We're a little envious of Teigen's pampering session as we sit at our office desks trying to work (is it Friday yet?). We also appreciate the mid-week laugh while watching Teigen try to drink from a straw as she wears the Halloween-like mask. She. Keeps. Missing. Her. Mouth. LOL. But while Teigen's mask looks really cool, are LED masks actually beneficial to your skin? And, most importantly, are they safe to use? Absolutely, experts say. LED (light emitting diodes) are essentially just infrared lights that are found in different wavelengths depending on the color, says New York-based dermatologist Rachel Nazarian, MD. These lights help to clear skin and also offer anti-aging benefits, she tells us. "LED lights don't cause burns or skin damage, which makes them great for every skin type and colour," Dr. Nazarian adds. However, she does recommend that clients wear eye protection during a professional treatment. 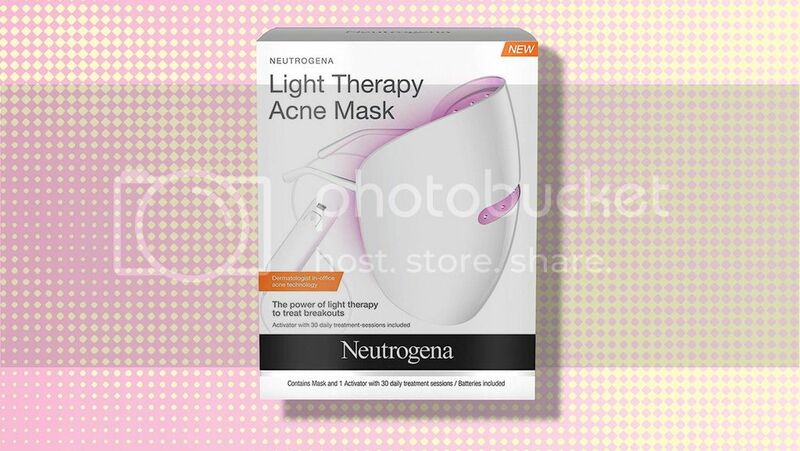 We may not be able to afford Teigen's LED mask, but there are at-home options that work well, too. "[These masks] stimulate collagen production certainly more slowly than a laser done in a doctor's office, but they are safe and effective," says Debra Jaliman, MD, a New York City-based dermatologist and author of Skin Rules (amazon.com). She tells us that she's a big fan of these types of masks herself. Curious as to what all the fuss is about, but don't want to drop a lot of money? This dupe from Neutrogena won't break the bank and is dermatologist-approved. Dr. Jaliman has tried it and confirms it's incredibly easy to use, quick, and totally painless. The box contains one Light Therapy Acne Face Mask, which helps clear breakouts and allows your skin to heal with the help of blue and red lights that target acne-causing bacteria and reduce inflammation. Plus, the mask is gentle enough for even the most sensitive skin and is safe for daily use. After cleansing, place the mask over your face, push the button, and let it sit for 10 minutes (it will automatically shut off when the timer is up). If you're a sheet mask fanatic and want something a little more powerful to address stubborn acne, we say abide by the What Would Chrissy Teigen Do? rule and give an LED mask a shot. This article first appeared in Health. INTRAcel combines microneedling with radiofrequency and fractional resurfacing, this cutting-edge procedure with little downtime is effective for sagging skin, jowls, lines and wrinkles, large and open pores, acne and acne scarring and stretch marks/scarring. The E-Plus Sublative Skin Renewal treatment utilises a fractional bipolar radiofrequency technology to treat mild to moderate wrinkles, acne scars, discolouration and tectural irregularities. An effective treatment targetted at stubborn acne scars with the revolutionary pneumatic needle-less sytem. Get to the root of the acne problem with a treatment programme that includes laser therapy for smoother, acne-free skin and smaller pores. This programme includes a laser carbon peel, Acne Buster Facial, Deep Pore Cleansing Facial, and glycolic acid peel treatments. Get to the root of the acne problem with a treatment programme that includes pampering yet healing facials and no downtime facial peels for smooth, acne-free skin. This programme includes a two Acne Buster Facials, two Deep Pore Cleansing Facials, and two glycolic acid peel treatments. 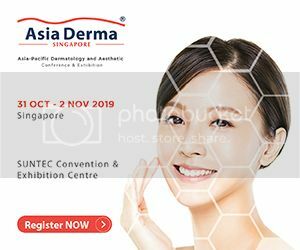 Get rid of the ugly acne scars and pigments left behind with a treatment focused on skin renewal and skin smoothening. This programme includes two fractional CO2 laser treatments and two glycolic acid peels.